Cocoa and Lavender: A Smokin' Hot Condiment! always, it’s the condiments that (could) kill me. When I dine at friends’ homes, and they know of my garlic allergy, they are so kind and careful never to cook with garlic. But it is hidden everywhere - not just in prepared foods where one might expect it, but in all sorts of condiments: mustards, mayos, ketchups, steak sauces, soup bases, hot sauces, and rubs. I, along with my friends, have come to excel in label reading. And, now that my eyesight is getting worse, I discovered a new trick! When in the grocery store, I take a photo of the label with my cell phone and then enlarge the photo on my screen so I can read it. (A note to label creators: Try using contrast. White font on a light beige background is hell. As is brown on black. Just sayin’…) The other day in the grocery store I was comparing two boxes of chicken broth within the same brand: a new organic version, their old tried-and-true. Normally, I would take the organic but, for some reason, their “new” organic broth has garlic. Their old recipe does not. What's with that? 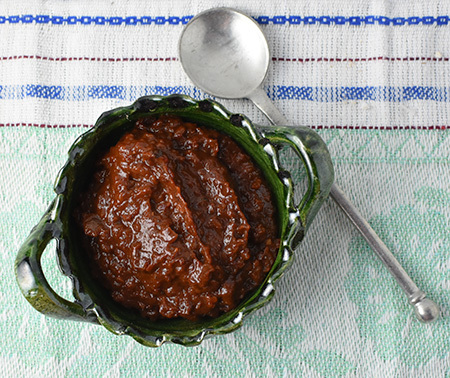 Chipotle chiles in adobo (dried, smoked jalapeño peppers revived in a tomato-based sauce) is one of our favorite condiments for adding to soups, stews, vegetables, marinades, and sauces. They are widely available in small cans but only once was I able to find a can that didn’t list garlic. And that was more than 25 years ago. Thus, like many condiments everyone else has the luxury of taking for granted - taking from the grocery shelf - I need to make my own. Truth be told, this turns out to be a lot of fun, and the kitchen smells great. Honestly, I think learning to make my own condiments has made me better cook. It certainly makes me appreciate how flavoring happens in food, and what the home cook had to do before there were millions of tiny bottles of this-and-that available for purchase. 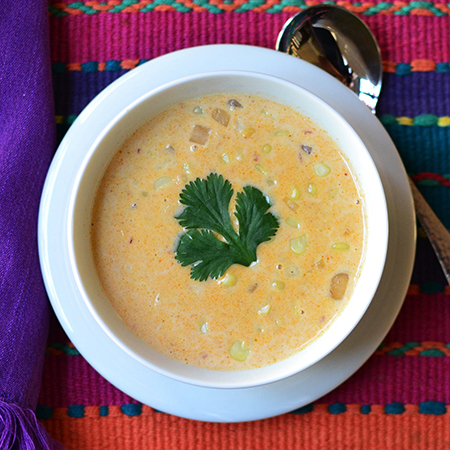 If your are unfamiliar with this condiment, here is a link to a Santa Fe Chipotle Corn Chowder that will warm any winter night. I hope it is warm where you are... if not, make some chipotles in adobo and feel the heat! Thanks to Laura & Arch for the beautiful tea towel & ceramic bowl from Oaxaca. Heat the olive oil on a skillet over medium-low heat and cook onions and shallots until clear and slightly golden. While the onions and shallots are cooking, remove the stems from the chiles and place them in a bowl. Cover them with boiling water and weigh them down with a small plate; soak for 20 minutes. They will not soften as much as other chiles; don’t be concerned if they feel leathery. Remove the soaked chipotles and place them in a blender (see note below); reserve soaking liquid. Add the tomato sauce, tomato paste, and brown sugar. Blend until you have a uniform paste. Scrape the blended chipotles and tomato sauce into saucepan and add in 1/2 cup of the soaking liquid. Add the cooked onions and shallots, along with the salt and vinegar to the pan. 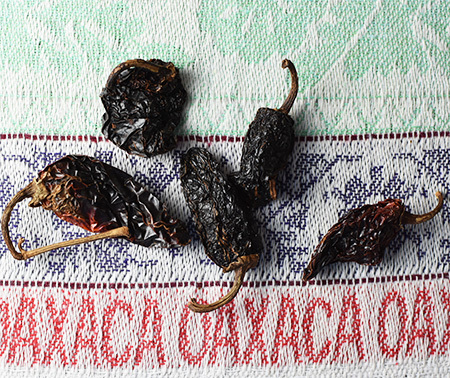 (If you are keeping some chiles whole, add them at this point.) Mix well. Bring to a boil, then reduce heat and simmer for 90 minutes until very thick. Check often after the first hour. If the sauce has dried too much, add reserved soaking liquid as needed, using water if you run out of soaking liquid. As it cooks, the mixture will turn a very dark, mahogany brown. I like to purée the mixture one more time before putting it in jars. Leave it chunky, if you prefer. Keep it refrigerated, or freeze. Makes between 1 1/2 and 2 cups. Note: If you would like some whole chipotle chilies, purée half of them with the tomato sauce, and reserve the remainder to cook whole. Death by Condiment... I love that title! 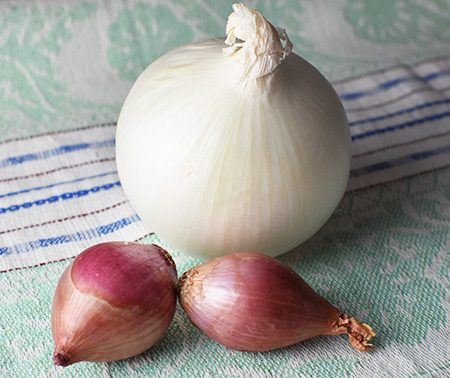 Thank goodness you can have onions and shallots—life without alliums would be rather dull, wouldn't it? Although my landlord in Italy was actually allergic to all kinds of alliums and said he didn't mind at all. Hard to imagine. I know, Frank - I loved onions, shallots, and leeks - can’t imagine life without them! However, I thought the same thing about garlic and don’t actually miss it! Your poor landlord! Can’t imagine that! My Sicilian uncle didn’t love garlic - said it gave him serious indigestion. I wonder if there was a mild allergy there? Being allergic to garlic must be hard. All the challenges we have to overcome,but you’re making the best of it by making your own. It would be fun to make your own chipotle chiles in Adobe. Do you freeze some for later? The biggest challenge, Gerlinde, is that so many companies and chefs think that everything must start with garlic. I think even if I could eat it, I would be turned off by how much everything tastes the same. We all must learn subtlety! Happy, Marcelle, I don’t know anyone who makes labels, otherwise I would give them a piece of my mind! I actually enjoy making my own condiments! Great fun! David, this is something to add to my must-make list. Funny thing about my garlic allergy is that Lea & Perrins Worcestershire sauce doesn't bother me. I can't think why. Maybe because I've eaten it all my life? Or because it goes through such a lengthy process? Anyway ... I'm glad! Your comments about the hard-to-read labels is right on, and your solution clever. Lea & Perrin’s - even in the smallest amounts - is one of the worst for me, Jean! Anything with dehydrated garlic tends to make me sick faster and with much worse effects... think deli roast beef, dry rubs, and such. Interesting. I've always noticed that things with garlic powder, as you mentioned, make me sicker faster. Can't think why the L & P doesn't bother me. My doctor told me that dried garlic, because it is concentrated, is worse... and because it ingests differently, goes into the system faster. Dry rubs are my nemesis! And this is really, really hot, Carolyne! I guess it all depends on the dried chipotles, eh? 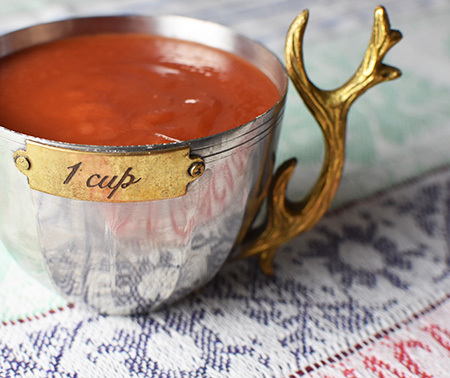 Now this is a handy recipe to have- I didn't realize you could make your own and I have always bought the little cans. I was recently able to buy dried chipotles at the Mercado Hidalgo in Tijuana but they're not too easy to find north of the border. It's all very interesting, isn't it! There are a few Mexican grocery stores here that have them, but Penzeys is a easy source and they ship if you don’t have one nearby! I have shipped many chipotle chiles to Italy and Australia for friends in need! Sorry to hear about the allergy. Have you tried (or, at least look the list of ingredients of) Asafetyda ? When attending the classes of Japanese cooking, we used it many times to replace onions and garlic.... maybe this could be a good substitute. Good luck with it and last but not least, I like your works very much ! Hello again! Thanks fro your kind words - and I look forward to your recipes! (I just subscribed.) Yes, I do use asafetida - I learned about it from an Indian cook. It is fascinating that you learned of it in a Japanese cooking class! As onions aren't a problem, (thank goodness), and I can eat shallots, and leeks, I am in pretty good shape. No one ever seems to miss the garlic when they come to the house. I do exactly the same thing with my phone to read labels at the market! Love that I'm not the only one. :-) So tricky to have an allergy like this -- where the ingredient you're hiding from sneaks in everywhere. I love your recipe for chipotles in adobo -- I use this all the time and will finally try making my own. Thank you! What would we do without our phones, Valentina? I worry about upgrading to a better phone because the magnifier got left behind. Back to taking photos of the labels! Garlic is in everything but I have gotten really good at discovering chefs who either make things fresh enough that leaving out garlic isn't a problem, or chefs who are creative enough that garlic doesn't appear in every dish they serve. I can always work around garlic... although I am having trouble making roasted garlic without garlic. Compared to John, going without bread would be unaccustomed, without pasta possible but not too welcome but without ALL of the allium family and especially garlic, close to unbearable . . . Can eat garlic bulbs like apples . . . and they truly do not smell on me . . . have some honest friends :) ! Need some chillies in adobo, but may just buy . . . . the recipe will be there as a backup . . .
Luckily, Eha, I can have all the other members of the allium family, and that makes me happy enough. I do notice that some people really smell of garlic while others (you) don't. 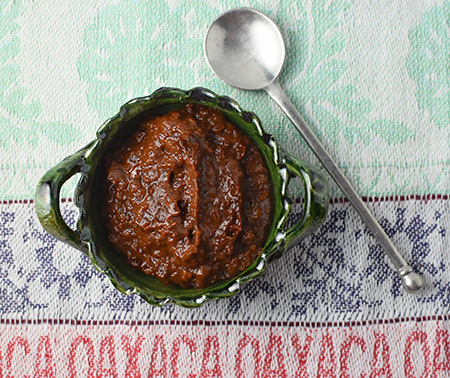 We love Chipotle Chiles in Adobo - but never thought to make them from scratch. Thank you for the inspiration! It really is fun making your own, Nicole... it is fun to alter the taste profile - my next batch will have some Mexican oregano! I'm a super huge fan of homemade condiments, and love this recipe David! I don't take for granted finding chipotles in adobo here, so I love the simplicity of your recipe. On the plus side, garlic makes you eat better, less processed food. I'm so glad I have no allergies. Although, I'm with you on reading labels. Some of the stuff that gets in there is truly disturbing, allergy or no allergy. Interesting that sugar is almost always in there! Chipotles in adobo is something I've only ever bought in a tin. Why have I never thought to make it myself! Worse than sugar, John, is the high-fructose corn syrup and all the chemical preservatives... unbelievable! I really need to try this! I love the flavour of chipotle chillies and this would be perfect to add to so many different meals! I love the flavor, too, Caroline... it does liven up just about everything! This recipe looks really good. 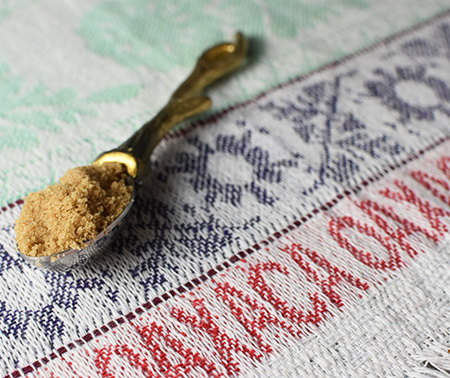 Sugar is another added ingredient, the amount of which can usually be lowered--another reason for making your own ingredients! I think the sugar can be okay as long as it is moderate. High fructose corn syrup, however, is another story! Dear David, that allergy sounds similar to the one that Freya has - she can never eat processed food and, like you, I only buy tinned tomatoes, corn and the odd beans or chickpeas. Having to read each and every label does make you eat better...And I am waiting with bated breat for that thriller of yours “Death by Condiments”. Ganz liebe Grüße aus dem unglaublich kalten Bonn! Poor Freya! At least she is lucky you are her mother and already cook so healthy for her! An allergy to garlic at times must be hard to manage as it’s added to so much. I love the idea of making my own condiments I bet they would taste so much better. It could be a lot worse, Emma! And I do think they taste better when homemade! My eyesight went seemingly overnight! I hate it as I too, have to read labels so carefully for my daughter's severe nut allergy. Here's another tip, if you have an iPhone, it has a built in magnifying glass. You just click 3x! If it doesn't work, you may not have it turned on. 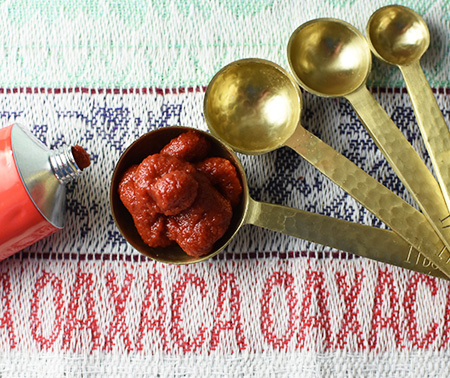 I love this hot sauce recipe, sounds so good!! I love the magnifier - but I have noted that many of the newer iPhones don't have it. Makes me reluctant to give up my 6! I love your idea on how to use this - I will give that a try! After we decided to eat local, I canned a few condiments last fall, loosely "canning along" with the Food in Jars challenge. It really is fun! Your Chipotle Chiles look amazing. Next year! I really enjoyed your canning posts, Inger!